Issue 7.11 is now online! This month’s issue contains four Applications articles and two Open Access articles, all of which are freely available. – moveHMM: This R package allows ecologists to process GPS tracking data into series of step lengths and turning angles, and to fit a hidden Markov model to these data, allowing, in particular, for the incorporation of environmental covariates. – BORIS: An open-source and multiplatform standalone program that allows a user-specific coding environment to be set for a computer-based review of previously recorded videos or live observations. Being open to user-specific settings, the program allows a project-based ethogram to be defined that can then be shared with collaborators, or can be imported or modified. – inbreedR: An R package that provides functions to measure variance in inbreeding – through the strength of correlation in heterozygosity across marker loci – based on microsatellite and SNP markers with associated P-values and confidence intervals. Within the framework of Heterozygosity–fitness correlation theory, inbreedR also estimates the impact of inbreeding on marker heterozygosity and fitness. – Terrestrial Precipitation Analysis: This package is comprised of the Precipitation Trends (P-Trend), Precipitation Attributes (P-Att) and Precipitation Manipulation (P-Man) tools. Combined, these web tools allow researchers to easily calculate fundamental precipitation statistics for past, present and projected future precipitation regimes for any terrestrial location in the world. Caren Goldberg et al. provide this month’s first open access article: ‘Critical considerations for the application of environmental DNA methods to detect aquatic species‘. In this review article the authors present a synthesis of knowledge at this stage for application of environmental DNA methods. This includes critical considerations for study design (such as preventing contamination in the field and the laboratory), choosing appropriate sample analysis methods, validating assays, testing for sample inhibition and following minimum reporting guidelines. ‘State-and-transition simulation models: a framework for forecasting landscape change‘ by Colin Daniel et al. is our second Open Access article in this issue. In this article, the authors present a general framework, called a state-and-transition simulation model. State-and-transition simulation models can be applied to a wide range of landscapes, including questions of both land-use change and vegetation dynamics. Because the method is inherently stochastic, it is well suited for characterising uncertainty in model projections. David Warton interviewed Marie-Josee Fortin about this paper earlier in the year. Our November issue also features articles on Automated Content Analysis, Community Ecology, Habitat Selection, Acoustic Monitoring, and much more. 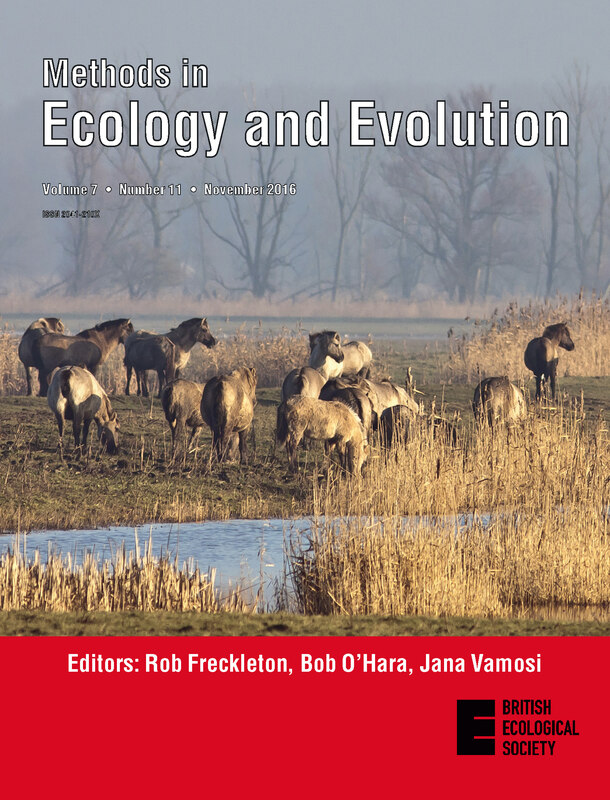 This month’s cover shows the Oostvaardersplassen nature reserve, Netherlands. It was established on polder land reclaimed from Lake IJsselmeer in 1968. Re-wilding was initiated at this site from 1983 with the introduction of Heck cattle (Bos taurus), Konik horses (Equus ferus caballus) and red deer (Cervus elaphus). Moreover, a multitude of ponds were created throughout the reserve between 1985 and 2000 for avian biodiversity. The site is managed with a policy of minimal intervention, i.e. the population size of freely roaming large herbivores is not controlled by culling, no supplementary feeding is given during winter and vegetation is not managed. The only intervention is aimed to avoid unnecessary suffering and consist in shooting animals identiﬁed as too weak to survive winter. Most of the research examining the relationship between large herbivores and their impact on landscapes has used extant studies. An alternative approach is to estimate the impact of variations in herbivore populations through time using fossil dung fungal spores and pollen in sedimentary sequences. The ponds at Oostvaardersplassen provided the ideal settings for Baker et al. to develop further the dung fungal spore method and determine the relationship between spore abundance in sediments and herbivore biomass densities. Their results indicate that this method provides a robust quantitative measure of herbivore population size over time. The method is described in ‘Quantification of population sizes of large herbivores and their long-term functional role in ecosystems using dung fungal spores‘. You can read more about this article in the blog post that the authors wrote for National Bison Month. This entry was posted in Journal updates and tagged Acoustic Monitoring, Automated Content Analysis, community ecology, Dung Fungal Spores, ecology, eDNA, Environmental DNA, evolution, Habitat Selection, Herbivore Biomass, Heterozygosity, Hidden Markov Models, Inbreeding, Methods in Ecology and Evolution, monitoring, open access, Precipitation Analysis, R, State-and-Transition Models by Chris Grieves. Bookmark the permalink.